Economically, the largest country in the world is the United States. The strength of the country lies beyond the design and production of material goods (such as automobiles and technology) and services (such as finance and 'fast food'), for the most visible U.S. products are the cultural and entertainment products such as Hollywood movies, music recordings and sports entertainment. Within the US, there are three major sports that operate seasonally --- American football, basketball and baseball. Within all three sports, the odd reality is that each is disproportionately over-represented by minority players (namely, blacks and latinos). In the case of baseball, as much as 30% of the Major League Baseball players are of Latino descent, much higher than the 11% in the population as a whole. The majority of these Latino baseball players are foreign born, from countries such as Cuba, Dominican Republic, Venezuela, Panama, Nicaragua and elsewhere. For Latin Americans, playing in Major League Baseball represents a success of the highest visibility as well as an almost unfathomable financial windfall. Here are the 2001 salaries for the top 10 Latino players in the American League and National League divisions of Major League Baseball. It is one thing to see a small number (that is, relative to the total of almost 500 million) of Latin Americans succeed at the top level. But how popular is baseball in Latin America today? There are several ways to measure the popularity of baseball. First of all, we can try to see how many people actually play the sport. Of course, the popularity of a sport is not necessarily gauged by participation. Not all sport fans may play the sport itself. In fact, in the case of Formula One racing, most of the fans will never get to steer one of those machines. In another approach, we may want to see how many people actually attend the sport events as spectators. Again, not all sport fans may attend live performances, since many of the events actually occur in faraway places. Reluctantly, perhaps, we end up trying to count how many people watch the sport on television. Indeed, television contracts have become the major source of revenues for sports in the USA because this medium can bring the sport to a much larger audience than can conceivably be accommodated by any live venue. We will now refer to some survey data taken from the TGI studies in the Latin America. The survey database contains a total of 51,432 persons 12 years or older who were interviewed during the year 2001 in Argentina, Brazil, Chile, Colombia, Mexico, Panama, Peru, Puerto Rico and Venezuela. According to the survey, 4.6% of the people said that they frequently watch baseball on television. This is not a high number at all, either in the absolute sense or relative to the television audiences for soccer or even basketball. 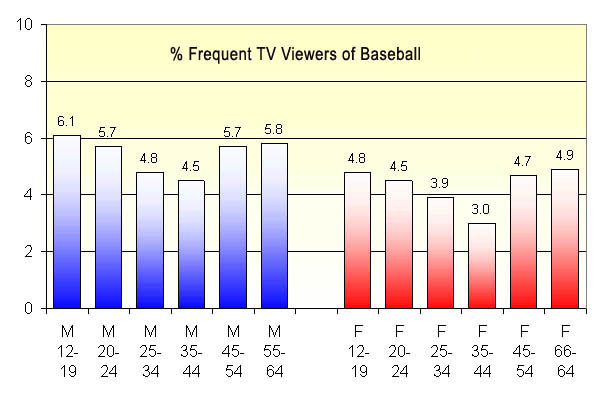 In the next chart, we show the gender breakdown of the regular televised baseball viewers, who are seen to be more likely to be young or older males. But across the board, there still does not seem to be any group that is particularly high. A much stronger driver of viewing of televised baseball is shown in the next chart. 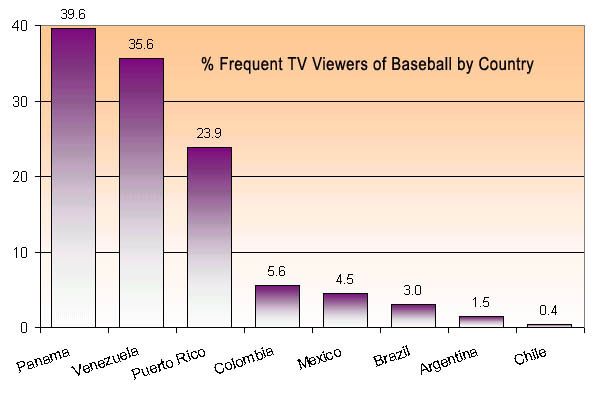 Baseball is much more popular in Venezuela, Panama and Puerto Rico, and much less so in the other countries. Of course, this is a self-reinforcing mechanism. In the common lives of the citizenry of Venezuela, Panama and Puerto Rico, baseball is the primary sport in terms of participation, live attendance as well as television viewing. In the other countries, soccer (football) rules. This is a self-reinforcing mechanism. Mass participation in a particular sport sets up the environment for star players to emerge locally and eventually migrating to Major League Baseball in the USA where fame and fortune awaits. Such Latin American stars become idols for their compatriots, thus generating greater interest in the sport, thus feeding on the popularity. Conversely, a weak grassroots movement means that baseball stars are few and far in between from the other countries, thus rousing little or no interest from the populace and keeping the game off commercial television, further weakening the sport. Having said all this, we will point out that the group with the highest rate of viewing televised baseball are those who have actually played baseball in the last 12 months. Among this small group of people, 27% say that they watch baseball frequently. At the core of any sport will always be those who actually practice and love the sport.